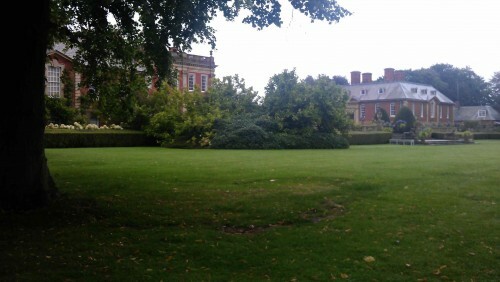 In late August I visited Cottesbrooke gardens, which surround Cottesbrooke Hall in Northamptonshire. I’ve been meaning to go here for some time, as different designers in different eras have created various gardens here, from Sylvia Crowe to Arne Maynard. So I thought a visit would mean learning about quite a few different styles at once. And so it was! It was dull and rainy on Bank Holiday Monday, but my friends are intrepid and not easily put off, so we got the umbrellas out and carried on. The house was built in 1702 so it is a Queen Anne house, and much of the 18th century landscaping has been restored, including lakes and vistas. The formal gardens round the house and the wild garden along a stream are mostly 20th century, initiated by the late Catherine Macdonald-Buchanan and continued now by her grandson Alastair. The first garden area is the forecourt, designed by Geoffrey Jellicoe. 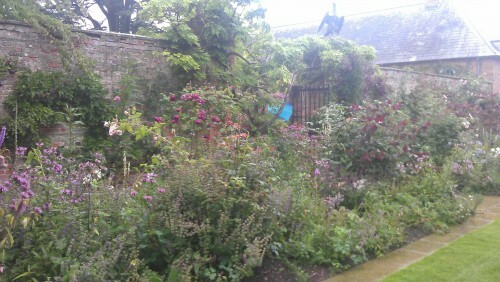 Here I must apologise for the quality of the photos – it was raining so I avoided taking my camera and used my phone! Later on I have included some photographs by Jerry Harpur (Harpur Garden Images) to show crisper, sunnier views. 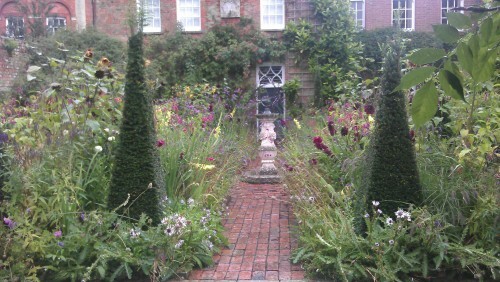 We turned left onto the Statue Walk, where Arne Maynard has designed the planting. This is its first year, and it is looking fantastic. Purple-leaved Cercis canadensis ‘Forest Pansy’ trees are spaced along the two beds – part of the walk which surrounds the water garden – along with a very romantic array of purple, pink and white plants. 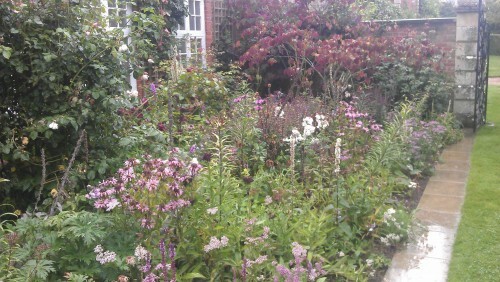 Pink Monardas, white pillars of verbascums, amethyst salvias, white cimicifuga and deep pink-purple clematis all worked beautifully together. Through a brick pergola from the Pool Garden, via a little courtyard, you come to the Dutch Garden which is next to the house. This originally had box hedges bordering four square beds. When the box died of blight, Alistair called in Angela Collins, a Northamptonshire designer. 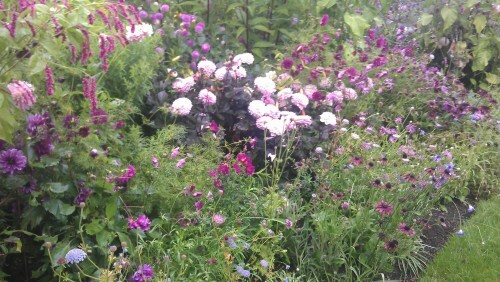 She has created some fabulous planting here, inspired by some gardens in France. The tall thin yew pyramids give some structure to a bold and beautiful array of tall plants arching over your head and spilling onto the pathway. Gladiolus byzantinus and cream gladioli, verbena bonariensis, wine-dark dahlias, yellow and maroon sunflowers and pale osteospermums mix along with roses. 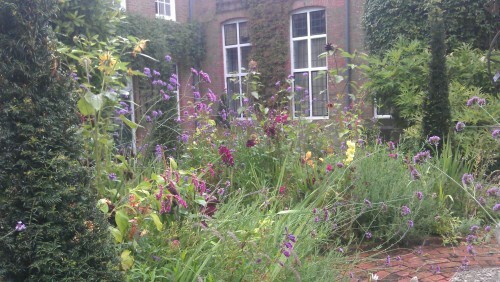 A great wildness in a simple formal layout of four square bed. I’ll stop here for now. My next post will feature beds by James Alexander Sinclair, who also wrote a useful article about the gardens here, and ends with the wonderful wild water garden.